This slow cooker meatloaf turned out so moist, and is pretty much fool-proof! I don’t understand why some people hate meatloaf, were they fed awful meatloaf as a kid? My mom used to make the best meatloaf, I wish I still lived at home and had my meals made for me! I finally found a recipe that is as moist and tender as my mom’s meatloaf and I had to share it with you. This slow cooker meatloaf is my new favorite comfort food, I’m going to put it on my weekly meal list every week. I served this meatloaf with smashed cream cheese red potatoes, and a green salad. I know you will enjoy this meatloaf as much as my family and I do! In a large bowl, add the eggs,onion, bell pepper, ketchup, milk, onion powder, salt, and pepper. Crush the saltine crackers in next, and mix this all together with clean hands. Add the meat next, only mixing everything until it just comes together. Spray a 6-quart slow cooker with non-stick spray, and shape the meat into a loaf on the bottom of the slow cooker. Cover, and cook on LOW for 5-6 hours, without opening the lid during cooking time. Scoop out the fat with a spoon, discard. Mix together the sauce ingredients, and spoon over meatloaf. Cover and cook for 30 more minutes on LOW. Serve and enjoy! Previous Post: « Cash Giveaway! This is going on tonight’s menu! Thanks for sharing; pinned also!! Sounds great! We love meatloaf and this is very similar to the current oven version I make. Never thought of putting it in a slower cooker so I will definitely try this. Thank you! 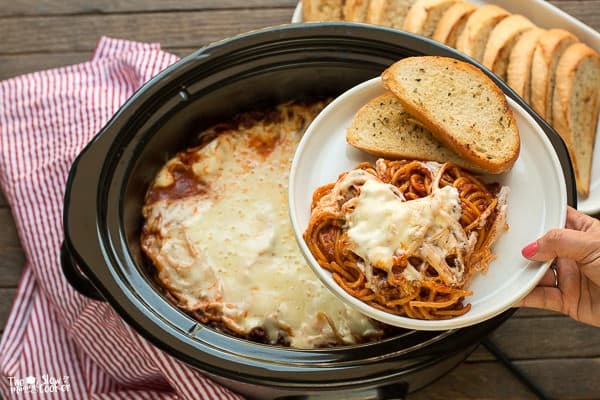 I love all the creative ways you use the slow cooker. I think this would be fabulous for when I have company for dinner. I mean, everyone loves meatloaf, it’s like the perfect meal with everything right there inside. Pinned! We absolutely love meatloaf and I always look forward to meatloaf sandwiches the day after! 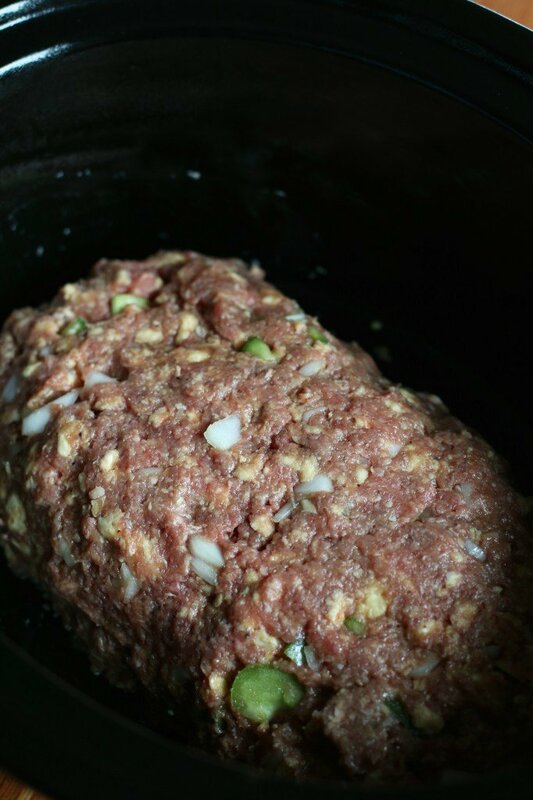 Cooking meatloaf in the crockpot is the best and this recipe looks delicious! I love this idea for Meatloaf! Your recipes sounds to die for! Simple and direct too! Loving all that! I think I am going to drop by our market and pick up a few things to make this!! Mmmm. That meatloaf looks good. This looks great. If you were to only make half the recipe, how long would you let it cook? Love it! the only thing I go is line the crock pot with sprayed foil, roll the edge then I an lift out to drain the fat or move it to an oven pan and Broil on high for 5 minutes when complete. great recipe, the house smells good for hours..
i would like to make this but I am gone much longer than six hours. Is it ok for it to go 10 hours? What could you substitute the crackers for if you don’t do gluten? I know my mom used dry oatmeal, that may be worth a try! Or if they make gluten free crackers, just use enough to bind the meatloaf. I do mine in my Tupperware microwave loaf pan with cover in the microwave I bought years ago. I too add saltines & oatmeal 1/2 & 1/2 amts or so. Good way to add fiber since I don’t like oatmeal for breakfast. Mine has ketchup, onion, eggs, salt & pepper also. Then top with ketchup last 5-7mins uncovered. I have not cooked again in regular oven in 35 yrs of marriage. Comes out moist every time. If I wanted to use a jarred spaghetti sauce instead of the sauce in this recipe how much would I use? Would it change the amount of cooking time at the end? I am a little bit behind today, can I cook this on hight? I noticed you emphasized LOW, but I’m just an hour or so short. I pinned this about a month ago, made it and it was delicious. I have it in the crock pot right now but used ground Turkey instead of ground beef. Fingers crossed ti turns out ok. I love using the crock pot. It’s been especially helpful since we are going through a kitchen remodel and I do not have an oven at this time. Thank you. I don’t have saltine crackers, but I’m wondering how much breadcrumbs I would use instead as a substitute? Thanks! I have this in my crockpot now, I made iit per your directions, except for the crackers. Will I have to skim fat off the top of the loaf? Also I cooked it on high for the first hour so do you think, time wise, it will be cooked and ready for the sauce topping at the start of the last hour? So it will have cooked in total 4.5 hours including the topping sauce. Sorry I just saw this! Yes, 4.5 hours sounds right. Let me know how it turned out. Something I do with this is place a few carrots in the bottom raises the meatloaf up out of the grease. Fantastic idea. I always have extra carrots. Thanks for sharing this tip! This recipe looks great! I plan to split the recipe. Would you recommend using one or two eggs? Or maybe one egg and just the yolk for another. Hi Libby, If I was testing this out, I would do 1 egg, mix everything together. Then if it seems dry, whisk another egg in a separate bowl and add part of it. I hope this helps. I made this and it was fabulous.. Just a tip! I use a slow cooker bag. Once the meat has cooked, I pull the bag out of the pot with meat, cut a hole to drain fat. Then I return to pot to add the rest of the ingredients… You can line the pot with a new bag to prevent clean up or just keep cooking in original bag. I use a second liner and just place the original bag meat and all back in pot to save time on clean up. Love this recipe!!!! That’s a great tip! I’m trying out a smaller meatloaf tomorrow with some cheesy potatoes in foil next to it. I love how tender the meatloaf turns out in the slow cooker. I make meatloaf with Taco flavor using cornmeal. I use Golden Hominy on the bottom to keep the meatloaf out of the drippings. The Hominy is delicious, just needs to be drained before serving. Do you think it would be okay to mix all the ingredients together, form into a loaf and freeze until ready to make? I am trying to come up with a few crock pot freezer meals but have never made any. Thanks. Try making it with oatmeal instead of saltine crackers and ground turkey meat too. It’s very tasty- my family loves it! For gluten free you can add ground white mushrooms in place of the saltines, it’s what my mom adds in her meatloaf now instead of bread or crackers. Such a great tip! I will try that! I use Sweet Baby Ray’s instead of Ketchup on mine and everyone just loves it. I do the same in another recipe, I add bacon and add sweet baby ray’s on top at the end. Best. Meal. Ever. I gave this recipe a try and it was wonderful! ❤ So moist. The only thing I changed was to add a bit of nutmeg & worcestershire sauce to the sauce. My family loved it and it was so easy! Awesome! I really love your additions!